In the photograph on the left 49 High Street is the three storey property occupied by ‘Hawkins of Thornbury‘. The building has changed substantially from the one that there in Victorian times – see below for an image of the smaller building which was there in those days and what it looked like when it was converted in the early 1900’s. Our knowledge of the early history of the property relies heavily on a packet of documents in Gloucester Records Office. We have supplemented this with the information from our other sources such as census records etc. We are also grateful to have been given notes made on the property’s history by Meg Wise of Thornbury Museum. The early deeds relating to the Tygers Head which was next door (now 51 and 53 High Street) show that the earliest owner of the ‘land’ on which 49 High Street now stands was Thomas Ockbourne and that by 1667 the land was owned by John Parker. The earliest transaction mentioned in Meg’s notes show that on 16th October 1688 Edward Parker, a mercer, sold the property to John Clarke, a tallow chandler. We note that in the Quaker records we copied in Salt Lake City an Edward Parker of Thornbury married Jane Bishop of Chipping Sodbury on 3rd February 1706. Another document dated 1719 shows that Edward also sold John a plot of ground in the rear called ‘the Old Garden’. It notes that Edward Parker was a maltster. An indenture dated 1850 provides a lot of useful information about previous owners and occupants. ‘All that messuage wherein one John Clark formerly dwelt and afterwards Bovey Clark tallow chandler deceased and wherein John Bevan shopkeeper afterwards dwelt and afterwards rebuilt by Thomas Rolph since deceased and wherein nine others sometime since dwelt and John Delaroche afterwards inhabited and Mrs Young widow lately dwelt and since in occupation of William Williams chemist and druggist afterwards Francis Gilman and now Edwin Knapp adjoining to the High Street on the westward part, to a former? Garden formerly of Robert Thurston gent deceased since of John Thurston his son and afterwards of Robert Boy and Richard Gwynn and now George Shepherd on the north, and to a messuage formerly called the Tigers Head formerly in occupation of John Wade blacksmith but now Stephen Hignell on south, together with outhouses passages etc to (blank) Knapp and in trust for said Edwin Knapp‘. The Clarkes – John Clarke bought the property from Edward Parker on 16th October 1688. It is possible that John was living in either 38 or 40 High Street in 1686 as the tenant of Anthony Horsley. John was a tallow chandler and a Quaker. In the Quaker records which we saw at Salt Lake City we noted the birth of a John Clarke, the son of John Clarke of Thornbury on 10th July 1682. A set of indentures dated 1st and 2nd May 1719 indicate that John was living in the property at that time. We are not sure as to the nature of this transaction. As there is a lease and release, we assume that John was conveying the property to his son, Bovey Clarke. In John’s will dated 4th July 1727 he left his household goods to his wife (unnamed) and then to his three sons. The will is quite difficult to read and the quaint spelling doesn’t make it any easier. He mentions his three sons, Bovey, Abraham and Thomas, grandson, Isaac (son of Abraham), grand-daughter, Hannah (daughter of Bovey) and grandsons John and Thomas. We know from the Quaker records that Bovey Clarke and his wife, Sarah had at least four children: John born 19th November 1720, Thomas born 10th May 1722 (who was buried on 14th February 1723), Hannah born 9th November 1724, another Thomas born on 13th April 1727 and William born on 11th March 1730. Records held in the Pennsylvania Archives show that ‘Bovey Clark, tallow chandler of Thornbury purchased 1000 acres of land from William Boye of Titherington in a deed of lease and release 24th and 25th March 1721′. By a similar deed dated 22nd and 23rd March 1725 Bovey sold that land to John Packer of Moorton for £30. Sarah died and was buried on 27th February 1754 at the Quaker burial ground in Thornbury. Bovey died and was buried on 4th May 1769. In his last will he described himself as a chandler and he made bequests of land and money to his daughter-in-law, Amelia Clarke who was the widow of Bovey’s late son, William. The rest of Bovey’s estate was left to his cousin, Thomas Clarke. We are not sure about what happened to the property at 49 High Street. The next reference to the owner was on 30th April 1778 in which Thomas Clarke arranges a mortgage with Jacob Young grocer, and then on 8th November 1784 there was a bond involving Thomas Clarke and Moses Amos a yeoman for £300 and interest. We assume that these refer to mortgage agreements made by Thomas Clarke as owner. Thomas Clark and his wife, Sarah, had two children: Thomas who had been baptised on 30th September 1731 and Sarah baptised on 18th July 1733. The deeds of the Quaker Meeting House in St John Street refer to Thomas Clarke the elder a tallow chandler being a trustee in 1748. This might refer to Thomas’s father. Thomas died and was buried on 10th May 1761. He had written his last will and testament on 16th June 1750 in which he left all his property to be shared between his two children. Thomas Clarke the younger was also a tallow chandler. We note that an indenture dated 20th March 1767 shows that Thomas Clark the younger sold his half share of his inheritance to George Rolph, as part of a pre-nuptial agreement. The agreement included the property on the site of Georgian House on The Plain and adjoining properties which later became 1, 1A, 3 and 5 St John Street. George married Thomas’s sister, Sarah on 31st May 1767. The property at 49 High Street was not part of that agreement. We know from the 1850 indenture quoted above that Bovey Clark a tallow chandler, then John Bevan a shopkeeper, then John Delaroche lived there. The land tax records show that Thomas Clark owned the property and it was occupied by Bovey Clark in the records from 1775 to 1782 and by John Bevan in 1783 and 1784 records. Thomas died aged 72 and was buried on 28th May 1803. A note on the burial record shows he was ‘found dead in his bed chamber’ aged 72. The Rolphs – we haven’t seen any documents confirming the transfer of property, but the last will and testament of George Rolph dated 1792 mentions he was leaving his son, Thomas Rolph ‘all that messuage or tenement wherein John Bevan did then dwell with the out house near adjoining on the northward part thereof with the stable and garden thereto adjoining situate in the High Street’. Land tax records show that Thomas Rolph had become the owner by 1796 and that he was occupying the property himself. He was still there in the 1797 record. The Abstract of Title written in 1850 mentions that Thomas Rolph re-built the property. By 1800 John Delaroche had become Thomas’s tenant and the 1809 record shows John Barnett in the property and then James Ford in 1810. Thomas and Frances emigrated to Canada in 1809 taking all their children. The notes made by Meg Wise indicate that following Thomas Rolph’s death there in 1814 the property was owned by his widow, Frances. She conveyed the property by indentures of lease and release dated 2nd and 3rd March 1818 to George Rolph her eldest son. Another indenture dated 22nd and 23rd January 1824 shows that George Rolph sold the property to James Ford. James Ford – an indenture dated 22nd and 23rd January 1824 shows that George Rolph sold the property to James Ford. The land tax records indicate that James was living at the property in 1810 as a tenant of Thomas Rolph. The 1812 land tax record indicates that he had become the owner although he was now living elsewhere and letting the property out to tenants. In January 1824 James Ford also bought from George Rolph a “ruinous toft and garden” on the site of what is now The Georgian House on The Plain. The indenture for that property shows that James was an inn holder. By 1841 James and his wife, Lydia had moved to Bredon in Worcestershire and then in 1851 they had moved to Rough Cast Farm, Castlemorton in the same area. James was aged 67 by this time and described as a farmer of 32 acres. The 1841 census shows the property was unoccupied. In 1850 James Ford sold the property to Edwin Knapp, cordwainer of Thornbury. We assume that James was the same person who also owned several others properties in Thornbury around that time including 47 High Street. We hope to pull together all the knowledge we have written about him and his family on the website at some time in the future. Sarah Surridge and the Hockleys – the 1859, 1862 and 1867 Rate Books show ‘Mrs Surridge’ as the owner of 49 High Street. Sarah was born in Worton near Potterne in Wiltshire. We don’t know her maiden name nor when she married John Surridge but they had a daughter Emily baptised on 14th March 1830 in St Mary Wesleyan Church, Devizes. The 1851 census shows Sarah was now a widow and she was living in Worton with Emily who was a dressmaker aged 21. On 25th September 1851 Emily married James Henry Hockley at Potterne. James was born in Gruel about 1829. He was a baker, the son of James Henry Hockley, another baker. The 1841 census shows them living at West Wellow in Wiltshire. We are not sure what influenced the family to move to Thornbury but by 1854 they had come to Thornbury. James and Emily had a son, John Henry Hockley baptised in Thornbury on 5th November 1854. A daughter, Fanny, was baptised on 7th October 1855 and another son, James George born on 5th September 1858. The baptism records and the 1856 trade directory show that James Henry Hockley was a baker trading in the High Street. The 1859 Rate Book shows Sarah Surridge had acquired 49 High Street for him to use as a shop and as a home for him and Emily. The 1861 census shows that Sarah was living at 1 Castle Street, which she was sharing with John Eyles and his family. It describes her as a widowed fund holder aged 64 born in Worton, Wilts. The Hockleys had returned to live in Worton with James’s widowed mother, Ann. James was working there as a farmer and the census shows that they had another son, George aged 2, born in Thornbury before they moved to Worton. By 1865 they had had at least one more child, Amy Hockley baptised 24th December 1865 in Wilton. The 1862 and 1867 Rate Books show that Sarah continued to own 49 High Street although it was then being let out to Stephen Applegate a baker (see below). Sarah also returned to live in Wiltshire. The 1871 census shows her lodging at 20 High Street in Devizes aged 73. She died in 1874 aged 76. On 2nd December 1874 an auction was held to sell the property owned by the late Sarah Surridge. It was described as ‘a valuable freehold dwelling house, baker’s shop and premises – all that commodious dwelling house, shop, bakery, flour lofts, cart house and two stall stable with other useful outbuildings, yard and garden …. now and for some years past in the occupation of Mr H. S. Applegate (under a lease which expires 25th March 1879) at the yearly rent of £24‘. The 1876 Rate Book shows that the property didn’t sell at the auction as Sarah’s son-in-law, James Henry Hockley is shown as the owner. Emily Hockley died in Worton in 1866. James re-married later the same year – his second wife was Elizabeth Sheppard from Fisherton in Wiltshire. They settled to live in Devizes where James traded as a baker and grocer and they had at least six children of their own. James died in Devizes in 1912. At the time of the sale in 1900 the property was described as ‘All that freehold messuage, dwelling house and shop, together with the bakehouse, stables, garden and yard adjoining thereto, now in the occupation of Mr George Witts, baker, situate in High Street. The house contains two sitting rooms, four bedrooms, two attics, boxroom, kitchen, large pantry, underground cellar, bakehouse, store-house, traphouse and good stabling. There is an entrance also from St Mary Street. The premises are admirably situated and adapted for the business of a baker or confectioner and have been used for such purposes during the last 40 years‘. John Maurice Augustus Chambers – on 31st December 1900 ‘Maurice’ Chambers bought the property for £450. This indenture made the 18th December 1901 between John Maurice Augustus Chambers of Thornbury, Clerk (the lessor) of the one part and William John Bennett (the lessee) of Thornbury, Baker the other part. To let for five years at the yearly rent of £28. Note – in Frederick Henry Burchell’s talk on Thornbury given in 1948 he mentioned this property as ‘a baker’s shop occupied by Mr. George Witts. His house is gone and in its place is the house now occupied by Miss Trayhurn‘. The photograph on the left shows what it looked like around 1900. It was then the two storey building with two bay windows on the ground floor and three windows on the floor above. The photograph on the right shows it had been re-built as a three storey building with bay windows on the ground and first floors and three windows above. We know that Thomas Exell was still the owner of the property in 1926 Rate Book at which time the property was unoccupied. We have a copy of the sales notice showing Thomas tried to sell the property in 1927. We don’t know any more information about the ownership, but we are assuming for the sake of the website that the following occupants owned the property. Mabel Ellen Trayhurn – Miss Mabel Ellen Trayhurn ran a preparatory school in the property for many years. She is listed in the Electoral Registers as being in the High Street in 1931, but she may have set up the school following Miss Ann’s retirement and sale of this property, both of which happened in 1927. This supposition appears to be supported by the advertisement shown here on the left (please click on the thumbnail image below to read it). The advertisement appeared on April 25th 1931 and said that ‘Miss Trayherne’ was re-opening her school at these premises, which are described as “of a modern type.” This suggests a major refurbishment had recently occurred. The school continued there until the mid 1950’s. Mabel started at Thornbury Council School on 2nd September 1889. She went on to become a teacher. The 1901 Census describes Mabel as a ‘Teacher at School’. The census didn’t indicate the school where Mabel worked, but the log books of the National School (now called St Mary’s School) show that ‘on 25th March 1902 Miss Mabel Trayhurn was ill and unable to attend the collective examination of pupil teachers’. In 1904 she was still being listed as a pupil teacher in a list of the National School teaching staff and in May 1906 it was noted that Mabel failed the King’s Scholarship examination. The school log books show Mabel started as a teacher in the Council School on 9th July 1906, although in Tony Cherry’s book on the history of the Council School he says Mabel starte d there in 1909. The log books mention Mabel throughout 1906 and 1907 as she was absent from work on several occasions. Tony’s book says she continued teaching at the school until shortly before the death of her brother Charles Victor which happened in 1916. We know from an oral history interview given by Sally Gordon (nee Grace) who was born in 1911 that she first attended Miss Ann’s Dame School in the High Street and was then educated at home with her sisters and brother by Mabel Trayhurn before being sent to boarding school. This might indicate that Mabel operated as a governess in the earlier years. Mabel appears to have set up her own school at 49 High Street about 1931. She is listed as living in the High Street in the 1931 electoral register. The Gazette of 2nd September 1933 announced that Miss Trayhurn would be pleased to interview the parents of present and prospective pupils for places in her school for the coming year. 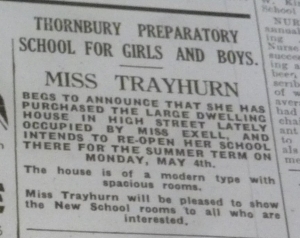 This implies that the school was being run by Miss Trayhurn before September 1933 . An advertisement from 1940 reads ‘Spacious and airy school rooms of modern type. Aim – to provide thorough training in the groundwork which is so necessary in preparing children in their later education. Backward and delicate children receive special attention without undue pressure. Extra subjects pianoforte and dancing’. Not and elocutio.es held by Thornbury Museum indicate that Mabel’s curriculum included arithmatic, english, scripture, singing, drill, drawing, needlework. We understand that Mabel was helped in her school by Miss Edith May Millin who was the daughter of Henry Herbert Millin, a railway guard stationed at Thornbury. She was born on 5th June 1919 and started at the National School in 1923. In 1958 Edith became Mrs Wilfred H Holley following their marriage at Weston super Mare. Wilfred was born in 1905, the son of Frederick John Holley. 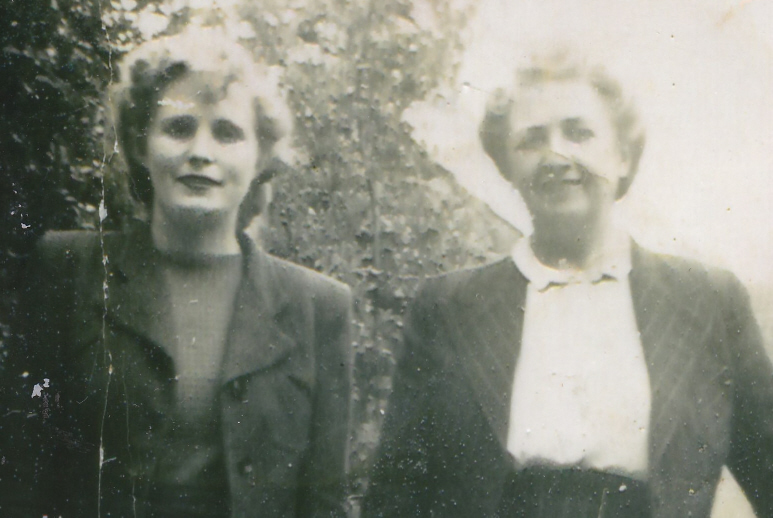 We have been told that the two photographs shown below are both of Edith (on the left) and Mabel (on the right). We are not sure who provided the first photo but the second one taken around 1950 came from Sheila Stockdale (nee Barnes) who had fond memories of the school which she attended from 1947 to 1953. Mabel carried on until about 1956 when the school closed down. Her name does appear in any of the electoral registers for Thornbury after this time so we assume she moved away. She died in 1971 aged 85 at Weston Super Mare.